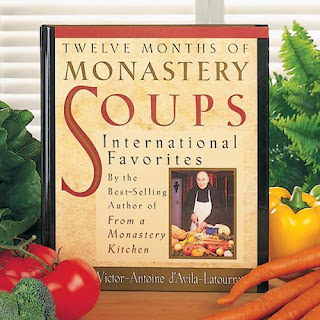 Partial Synopsis from Bas Bleu: These exceptional soups from a New York monastery kitchen vary in taste, texture, complexity, and origin, but all 167 (mostly vegetarian) recipes are deliciously tempting. Brother Victor-Antoine hopes his recipes will "help cultivate the art of soup making." My Thoughts: A nice big bowl of soup can be such a comfort! While I have yet to try all the recipes, the ones we have made are delicious! With different options throughout the months, lots of seasonal vegetables can be used. Fresh produce from my garden is always the tastiest! This pretty cookbook has quotes and bits of poetry here and there. You can also read snippets of history about cathedrals and saints. A lovely book I can definitely recommend! This must be interesting to read. I'll have to check it out. Soups are good comfort food. What an interesting cookbook! My husband and I like soups, so this would be a great idea for us! I think I would really enjoy this one! Thanks for sharing this on Booknificent Thursday at Mommynificent.com! Hi, Marci - Soups are my absolute favourite to both eat and to make. I will keep a look out for this book. Thank you for the recommendation. This sounds like a cookbook I'd enjoy very much! I love to make homemade soups and it sounds like there is other interesting information in it. Wow...interesting! A soup for every month, a great idea. Thank you for sharing with The Blogging Grandmothers. I have shared on social media.